If you are not ready to use them now, you can freeze overripe bananas for use later in baking. This is a guide about freezing overripe bananas. Do you sometime buy too many bananas? When the outside peel turns dark, don't throw them away. Take off the peel, put in zip lock bags, and freeze until you get ready to bake something. Use them in banana bread or any kind of baking that calls for mashed bananas. I bake with all my left over bananas. This was taught to me by my mother. Those browning bananas on your counter don't need to get thrown away, even if you aren't ready to use them right now. 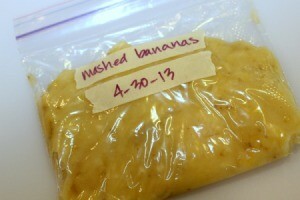 Freezing them is a great way to use them later in banana bread or any recipe that uses mashed banana. What a treat! I found very ripe bananas for $1/5 pounds. Very few were soft, so I took a chance. I also bought some chocolate shell, because I remember frozen chocolate covered bananas from my days of working at Knott's Berry Farm. I peeled as many bananas as my large round plastic food container would hold, breaking each one in half. They got sprinkled with lemon juice to retain their color. Then they went into the freezer, carefully covered. The next day I poured chocolate shell over them, and it set up immediately. But there wasn't enough chocolate to cover them all, so I got on the net and found a recipe that is way cheaper than the $2.59 teeny weeny bottle. 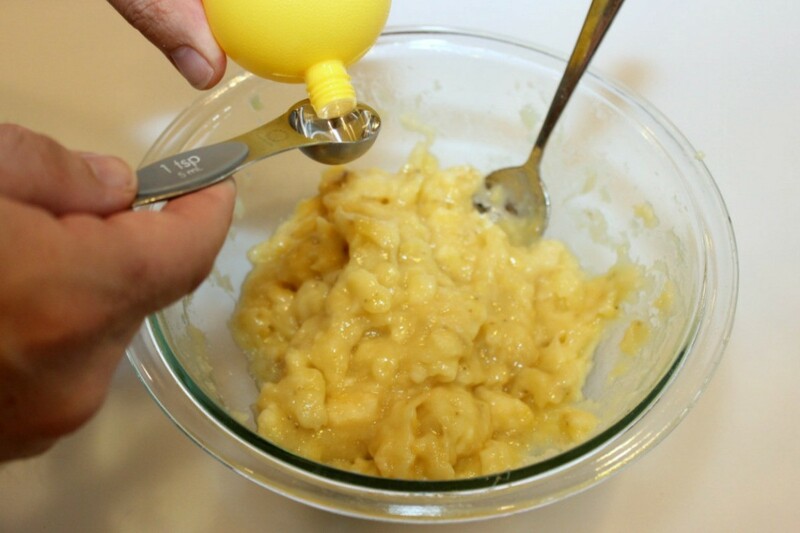 You melt 3 tablespoons of butter and 2/3 cup of chocolate chips over low heat together. That's it. Pour it over ice cream of frozen bananas. That made enough to finish the batch. We have enjoyed frozen bananas since then, and there are enough for about 25 servings. That left a bunch of the ripest bananas. I mashed them up and made the equivalent of four loaves of banana bread. We had company for dinner on Sunday and ate some. I sent a loaf home with one of our guests. And the other half of the batch will be served tonight at our grandson's going-away bash. Since I had almost everything on hand, I spent only $1.10 for bananas and $2.59 for chocolate shell. You don't have to use regular milk chocolate chips for the shell. Mine were the kind that are filled with peanut butter. I'll bet bittersweet would be really good. And it probably came out to a total of 65 servings of dessert. YUM! Now I'm watching for a sale on chocolate chips! I use to throw over ripe bananas in the freezer to be used in the future for baking. Now I put the peeled bananas in a covered baking dish and cook them for 4 to 5 minutes in the microwave. The pulp will separate from the water. Here is the perfect thing to do with bananas that ripen too soon. 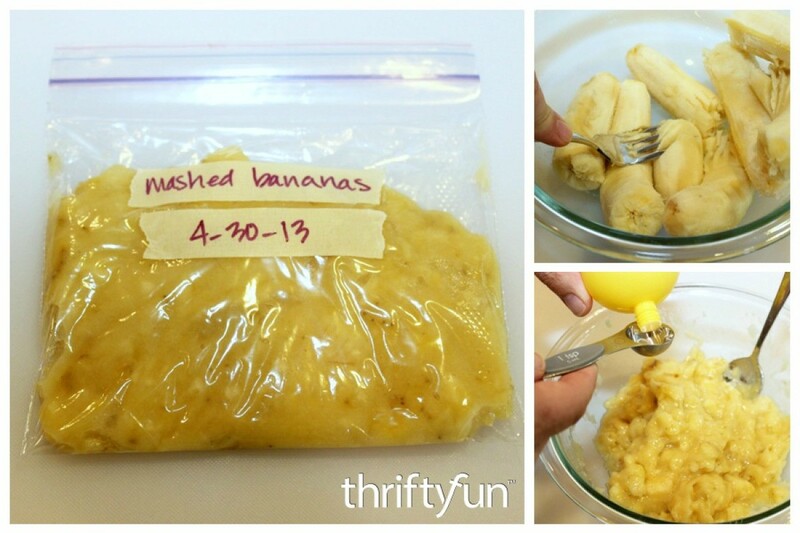 Mash them up and freeze them for a future batch of banana bread or pancakes, or just to add to a morning smoothie.